﻿Owl's Head from "Cliffs of Bond"
Owl's Head is located in the heart of the Pemigewasset Wilderness laying below the Franconia and Garfield Ridges, the Twinway and Bond's range. Owl's head has the longest approach of any 4,000 foot mountain and has absolutely no views and is usually not a favorite at all among peak-baggers. However what Owl's Head lacks in views it makes up for in rich logging history as early in the twentieth century camps and logging roads surrounded the mountain on all sides. Still today after all these years there are still remnants of camps, logging, and skidder roads that hikers run into on bushwhacks when doing a little exploring. 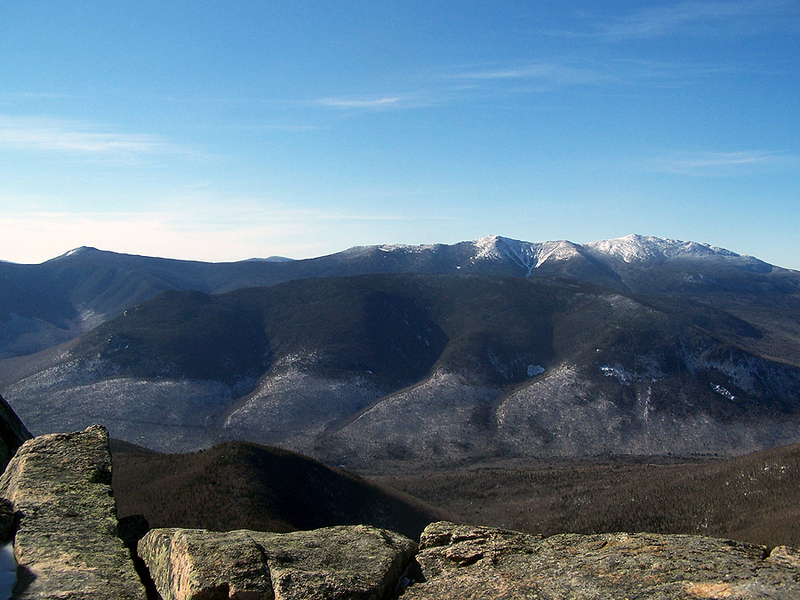 The two main approaches to Owl's Head are by the Lincoln Woods, Franconia Brook, Lincoln Brook, and Owl's Head Path trails. Round Trip is 18.0 miles (elevation gain of 2,850) over easy to moderate grades until one ascends the very steep slide on the bottom half of Owl's Head Path. Footing on Franconia and Lincoln Brook Trail are often wet and muddy. Water crossings on the Lincoln Brook Trail may be difficult to extremely dangerous after heavy rain or snow melt. To avoid these crossing many people hike the Black Pond Tail and bushwhack to avoid the first two major crossings. In the winter to avoid the Owl's Head Path's slide hikers will bushwhack to and old skidder road, this is called the "Brutus Bushwhack."